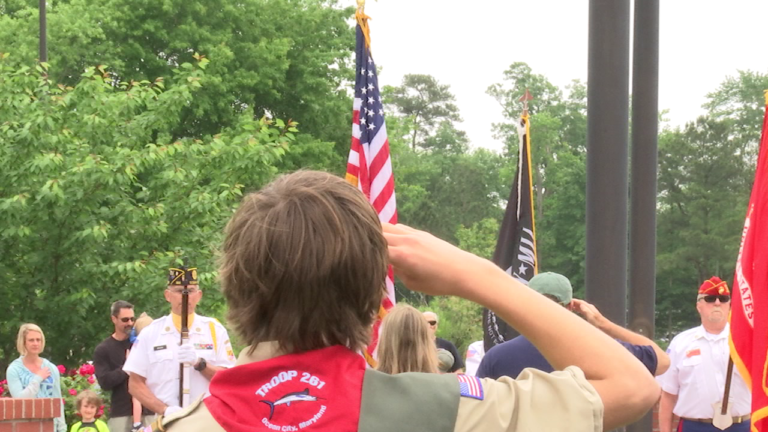 Delmarva honored the fallen with dozens of ceremonies on Memorial Day from Dover to Exmore. Mike Beatty, a speaker at the event said, "Today we are here at this beautiful Veterans Memorial to pay tribute to our fallen heroes and to recognize the men and women who gave all." Memorial Day is a national holiday created to honor and remember those who bravely fought, and made the ultimate sacrifice for our country's freedom. Congressman Andy Harris (R) MD-01 said, "Well you know, as a veteran, I hope we never forget our veterans, the fallen ones and the ones who are still with us, so we have to have events like this. We have to have an event in November, Veteran's Day and again, to make sure that Americans don't take for granted the freedoms and the liberties that we have." Ceremonies like the one held at the Worcester County Veterans Memorial Monday featured prayers, recognition of all veterans in attendance, and emotional renditions of American classics such as "I'm Proud To Be an American." We're told this year's holiday comes at a divisive time in our country, and veterans say they hope the holiday serves as a reminder of just how strong our patriotism should be. Joe Palmisano, a local veteran of World War II said, "We're in a time where some of our patriotism isn't as strong as it used to be, and it really should be, because everybody in the country owes all the veterans the fact that we're here." Rep. Andy Harris said, "What you see here today are all Americans getting together and celebrating our common heritage, our common liberty and freedom." Veterans tell us the atmosphere present at Monday's ceremony meant the world to them. William Conderey, a veteran said, "The whole ceremony was great. It was great." Jack Hallman, an ex-Prisoner Of War said, "This was a wonderful service today I've been here several years and every year I think highly of this affair"
Others, like Congressman Harris said they felt glad to see that fallen heroes were still being remembered and honored by hundreds of Delmarvans, decades after their passing. Rep. Harris said, "It's just so rewarding and refreshing to see that we have not forgotten those men and women who've died in uniform for the country." Veterans tell us it's important to remember and honor those who have served every day, not just on Memorial Day. If you're interested in seeing a memorial other than the one in Worcester County, a unique memorial called "The Traveling Wall" will be coming to Delmarva. "The Wall" serves as a reminder of the great sacrifices made during the Vietnam War. This memorial is scheduled to arrive at the Easton VFW on May 31st, and it will be there until June 6th.